This study aims to do further investigation on Chinese universities students’ attitudes towards native and non-native English speaking-teachers. It mainly studies two major researches on the topic with at least 368 participants from China (mainly) and Hungary. The study critically reviews the two studies and finds out that the fact about NESTs is unsatisfactory. It requires much improvement because of inexperienced NESTs, lack of responsibility, cultural unfamiliarity, and inability to provide opportunity for students to practice. However, it is inevitable that NESTs are considered better at English proficiency and that they are student-friendly teachers. In another study, students changed their preference over NESTs vs NNESTs because they believe that NESTs help maintaining their motivation to communicate in English. However, they might prefer NNESTs for cultural and linguistic (e.g. grammar explanation) competences. Thus, this study offers recommendations for improvement in the context. The recommendations include course on English proficiency, cultural competence, teaching skill, certification, and communication-focused concept of English materials. Barratt, L., & Kontra, E. 2000. Native English speaking teachers in cultures other than their own. TESOL Journal, 9(3), 19–23. Chang, J. 2006. Globalization and English in Chinese higher education. World Englishes 25(3/4). 513–525. Cheung, Y. L., & Braine, G. 2007. The attitudes of university students towards non-native speaking English teachers in Hong Kong. RELC Journal, 38(3), 257-277. Cook, V. 1999. Going beyond the native speaker in language teaching. TESOL Quarterly, 33(2), 185-209. Cook, V. 2005. Basing teaching on the L2 user. In E. Llurda (Ed. ), Nonnative language teachers: Perceptions, challenges and contributions to the profession, (pp. 47-61). New York: Springer. Creswell, J. 2002. Educational research: Planning, conducting, and evaluating Quantitative and Qualitative research. Upper Saddle River, NJ: Merrill Prentice Hall. Davies, A. 2004. The native speaker in applied linguistics. In A. Davies & C. Elder (Eds), The handbook of applied linguistics (pp. 431-450). Oxford: Blackwell. Fielding, N. 2004. Getting the most from archived qualitative data: Epistemological, practical and professional obstacles. International Journal of Social Research Methodology, 7(1): 97-104. Galloway, N. & Rose, H. 2015. Introducing global Englishes. London: Routledge, Taylor & Francis Group. He, D., & Li, D. S. 2009. Language attitudes and linguistic features in the "China English" debate. World Englishes, 28(1), 70-89. He, D., & Miller, L. 2011. English teacher preference: The case of China's non‐English‐major students. World Englishes, 30(3), 428-443. Hu, G., & Alsagoff, L. 2010. A public policy perspective on English medium instruction in China. Journal of Multilingual and Multicultural Development, 31(4). Jenkins, J. 2009. World Englishes: A resource book for students. London: Routledge. Jeon, M., & Lee, J. 2006. Hiring native-speaking English teachers in East Asian countries. English Today, 22(4), 53-58. Jin, J. 2005. Which is better in China, a local or a native English-speaking teacher?. English Today, 21(3), 39-46. Kachru, B. 1992. Teaching world Englishes. In Kachru, ed., The other tongue: English across cultures, 2nd edn, Urbana, IL: University of Illinois Press. Kirkpatrick, A., & Zhichang, Xu. 2002. Chinese pragmatic norms and ‘China English’. World Englishes, 21(2), 269-279. Kirkpatrick, A. 2009. Teaching English as a lingua franca. Paper presented at The 2nd International conference of English as a lingua franca. Southampton University: United Kingdom. Ma, L. F. 2012. Advantages and disadvantages of native and nonnative-English-speaking teachers: Student perceptions in Hong Kong. TESOL Quarterly: A Journal for Teachers of English to Speakers of Other Languages and of Standard English as A Second Dialect, 46(2), 280-305. Mairi, S. 2016. An English as a Lingua Franca (ELF) perspective in Asian English language teaching. Chinese Journal of Applied Linguistics. 39(4), 401-420. Medgyes, P. 1994. The non-native teacher. London: Macmillan. Mukhaiyar, Refnaldi & Mairi, S. 2017. Multimedia based teaching materials for Sociolinguistics course: A research and development project. Proceedings of the Fifth International Seminar on English Language and Teaching. 110(1), 126-130.
coping: Mixed methods approaches (pp. 169-211). The Research on Stress and Coping in Education Series (Vol. 5). Charlotte, NC: Information Age Publishing. Pacek, D. 2005. Personality not nationality: Foreign students’ perceptions of a non-native speaker lecturer of English at a British university. In E. Llurda (Ed. ), Non-native language teachers. Perceptions, challenges and contributions to the profession, (pp. 243-262). New York: Springer. Pasternak, M., & Bailey, K. M. 2004. Preparing non-native and native English-speaking teachers: Issues of professionalism and proficiency. In. L. D. Kamhi-Stein (Ed. ), Learning and teaching from experience: Perspectives on non-native English-speaking professionals, pp. 155-175. Ann Arbor: University of Michigan Press. Phillipson, R. 1992. ELT: The native speaker's burden?. ELT Journal, 46(1), 12-18. Rampton, M. B. H. 1990. Displacing the ‘native speaker’: Expertise, affiliation, and inheritance. ELT Journal, 44(2), 97-101. Seidlhofer, B. 2011. Understanding English as a lingua franca. Oxford: Oxford University Press. Sung, C. C. 2010. Native or non-native? Exploring Hong Kong students’ perspectives. In Paper from the Lancaster University Postgraduate Conference in Linguistics & Language Teaching (Vol. 4). Shalawati & Hadijah, S. 2018. Teaching Practicum Current Practices: Challenges and Opportunity. Journal of English for Academic. 5(1), 113-123. Wei, R., & Su, J. 2012. The statistics of English in China. English Today, 28(3), 10-14. Widdowson, H. G. 1994. The ownership of English. TESOL Quarterly, 28(2), 377-389. Xu, Z. M. 2010. Chinese English: A future power? In A. Kirkpatrick (ed. ), The Routledge handbook of world Englishes (pp. 282-298). London: Routledge. Zheng, Y. 2013. An inquiry into Chinese learners' English-learning motivational self-images: ENL learner or ELF user?. Journal of English as a Lingua Franca, 2(2), 341. MAIRI, Salam; FEBRIANI, Sri; SOLUSIA, Carbiriena. An Analysis of Chinese Universities Students’ Attitudes towards Native and Non-Native English-Speaking Teachers (NESTs/NNESTs). 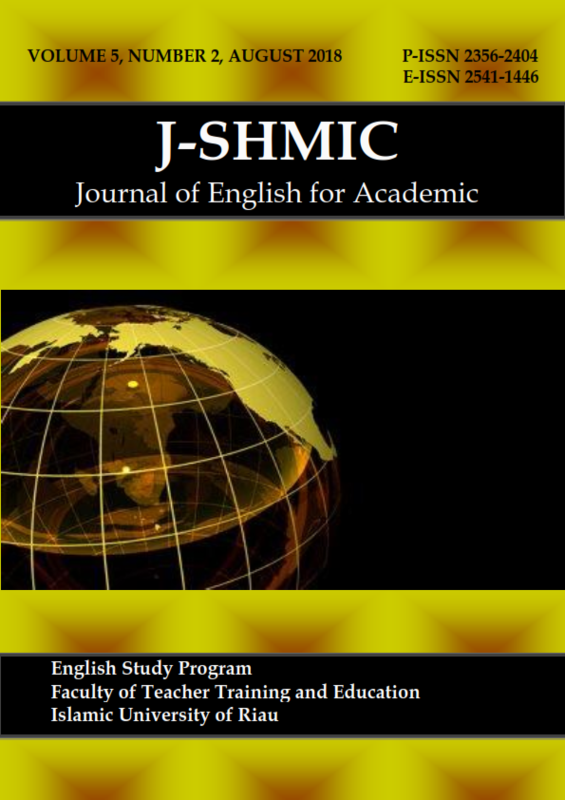 JOURNAL OF ENGLISH FOR ACADEMIC, [S.l. ], v. 5, n. 2, p. 86-96, aug. 2018. ISSN 2541-1446. Available at: <http://journal.uir.ac.id/index.php/jshmic/article/view/1850>. Date accessed: 23 apr. 2019. doi: https://doi.org/10.25299/jshmic.2018.vol5(2).1850.